Heavy, dense, tasteless, dry. 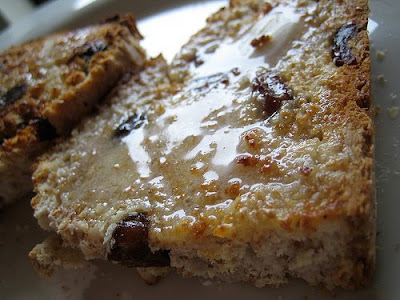 Often these are words used to describe the brick-of-a-loaf also known as Irish soda bread. Its bad rap had me wary but I overcame it when I saw Buff Chickpea’s lovely looking loaf. The fact that it looked like a perfect vehicle for butter had me sold. This bread is a quick bread, meaning there’s no yeast to bother with. It’s a snap to put together…if you can make a biscuit or a scone, this is no different. Plus, there are no eggs, so if you sub in the required non-dairies, you’ve got a great vegan bread. Normally, Irish soda bread is made with caraway seeds, but I didn’t have any on hand and decided to try fennel seeds instead. Definitely, a great choice. 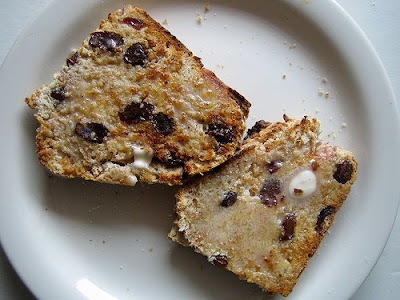 Along with the cinnamon, it made the bread super flavourful and definitely not bland or boring. It is a dense bread, but I didn’t mind that one bit, and I definitely did not find this bread too dry. It was great smeared with cold butter the same day and it was even more wonderful toasted the following day. A dab of blackberry jam and a strong cup of coffee, this bread made for a filling breakfast. I don’t think I’ll have to wait for next St. Patrick’s day to make this again. Preheat oven to 350F. In a small bowl, combine yogurt, milk, vanilla and apple cider and set aside to thicken. In a large bowl, mix together flour, salt, baking powder, and baking soda. Add cold butter into the flour and use your hands to break it up until the mixture resembles coarse meal. With a wooden spoon, stir in wheat bran, fennel, cinnamon, and dried fruit. Pour in milk/yogurt mixture and stir until the mixture starts to hold together into a ball. Dump the dough onto a floured surface and knead a few times. Pat into a dome-shaped lump and place onto a baking sheet covered with parchment paper or silpat. Sprinkle some flour on top and cut a cross into the loaf. Bake for about 1 hour or so, or until a cake tester inserted comes out clean. This is best eaten the same day…or toasted the next day. Must give the fennel variation a whirl, think I’d like that. I actually prefer a dense bread at times. Thank you for sharing, this is a must try recipe! Looks wonderful! I’ll have to give this a try. I make Irish Soda Bread every St. Patty’s day, so maybe this will the one I try next year–if not sooner! Pairs well w/ coffee for sure! I’m so glad you liked my post! I love the variations you made, I’ll have to try them out. The bread lasted all of a few hours at my house, so I think we’re due for another loaf. Drooooool this looks SO good. Especially with the large amounts of melted butter on that toasted slice mmmmm. You’ve inspired me to make Irish soda bread! Naturally, Daily Spud 😉 But try the fennel…it’s great! Oh yes, bellcurves, try this sooner! Yup, naomni, it’s definitely easy to veganize! Thanks Haley for the great recipe! haha, definitely better with butter, eatme! mmm…bread and butter – how I love thee! I have a love/hate relationship with bread. I love to eat it, but I hate that it ends up in the trunk 😉 Looks delicious and hearty! Your soda bread looks divine. I love that you used yogurt. And a dab of blackberry jam? Perfect. Fennel – what a fabulous substitution – I bet it was delicious!! Nicest soda bread I’ve ever seen! Too bad it does have a bum rap. oooh boy, that looks good…especialy toasted with the glistening butter! I love Hayley’s recipes: always flavorful, never dull. Just like yours. I do like irish soda bread, but mine has to be a tad bit moist and/or have some flavor to it. So this has to be bookmarked for me, for later. Ah Bijoux, live a little! Mmmm, bread and butter have never hurt anyone, really! Thanks Karina, it was great with the yogurt…a little bit of sweetness. Aimee, yeah, what’s with the bum rap? Well, I’m a convert. Yup, it was delicious, hag! Yay, Hilary, glad you loved this! This looks delicious! The one time I attempted to make Irish Soda bread was a disaster. Well, I thought it was…because it had no taste! This looks like a great variation to try out! this looks AMAZING. i’m glad our blog love is mutual! Rachael, this definitely has loads of taste! What is wheat bran? Is it like wheat germ? Or cereal? Where would I find it in a grocery store? Looks yummy, I added it to my recipe file–will try to make it this weekend! Yes, it’s like wheat germ. You can find it either with the baking supplies or cereals. Good luck! This looks like a great new version to try. I usually make mine quite simply with only the addition of raisins and/or dried cranberries as well. I’ve never tried caraway or fennel seeds – now I am anxious to attempt both. As for my favorite way to eat this bread: warm with some raspberry jam. Mmm, cinnamon, great addition! Love it. I made this as a side to an irish lamb stew…..brilliant. 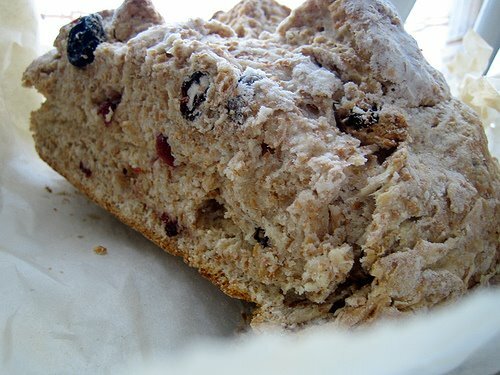 The best soda bread I’ve ever had. Will become a staple.